The aim of the text is to achieve a balance among computational skills, theory, and applications of linear algebra. It is a relatively advanced introduction to the ideas and techniques of linear algebra targeted for science and engineering students who need to understand not only how to use these methods but also gain insight into why they work. 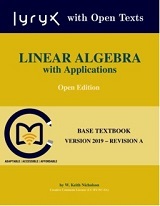 It introduces the general idea of Linear Algebra much earlier than the competition keeping with the same rigorous and concise approach to linear algebra. Along with the many diagrams and examples that help students visualize, it also keeps with the continuous introduction of concepts. Dr. W. Keith Nicholson earned his undergraduate Degree in Applied Mathematics at the University of Alberta, and received his Ph.D. in Pure Mathematics from the University of California at Santa Barbara in 1970. He then moved to the University of Calgary, and has been a professor in the Department of Mathematics and Statistics since 1979, where he has been carrying out research in a branch of algebra called "Ring Theory". His continuing interest in teaching undergraduate students has led to another book in Linear Algebra (now in its third edition), a text in Abstract Algebra (second edition), and the creation (with Professor Claude Laflamme), of an internet tutorial for Linear Algebra called ILAW (Interactive Linear Algebra on the Web). Keith is married and has two grown sons.